My mom and I can find the humor in just about anything. Call it a coping mechanism, if you will, but we aren’t big fans of being down and depressed for long, so if there’s a reason to laugh, we’ll find it. 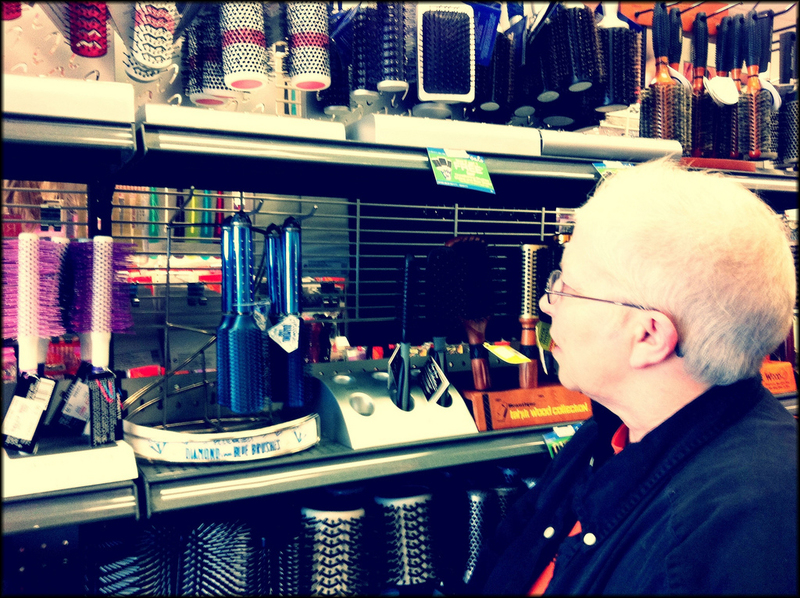 Hence the picture of mom, fresh off of chemo, looking at hair brushes in a beauty supply store. It was her idea to take it and send it to my sister, and we laughed so hard I’m surprised we didn’t get kicked out of the store. As I was glancing through my pictures last week, I came across this one again and had a good chuckle. It’s such a silly image, but what struck me this time is how often we all must look that silly. No, not because we’re all balding and shopping for brushes, but because we’re always longing for, and downright desperate to have, things we just don’t need. If you stop for just a moment, you can probably think of one or two things right now that you are just dying to have. Maybe it’s the newest Macbook Air, the latest iPhone, that Coach bag you’ve had your eye on, or that tiny 2-door sports car you’ve wanted since you were 16. Those are all fairly large purchases, and most of us aren’t able to just go out and splurge on things like that. But realistically, we convince ourselves we need a lot of things that we really could live without. Even worse, we often spend a lot of time praying (more like begging) for those things. And then to top it all off, we spend even more time being angry with God when he doesn’t “provide” as we are so often reminded He does. But the fact is, “the Lord will provide” does not mean “the Lord will grant your wishes”. We can pray and beg and pester and whine all we want, but expecting Him to provide things that we just don’t need is not only a waste of time, but it’s the very definition of selfishness. It leads to disappointment, misery and, ultimately, a very disillusioned image of God. Sure, we all want to have the finer things in life, there’s nothing wrong with that, and we enjoy them when we have them, but those things don’t bring true happiness. No, that happiness is found when we take stock of what God has provided for us and learn to be content. When we stop obsessing over what we want and find satisfaction in what we have, we are finally able to see our real needs as they arise. And when we pray about those needs and begin to see those prayers answered, we can finally appreciate the fact that He truly does “provide”, just as He promised. Contentment and trust in Him beat an iPhone any day. Take a moment today to reevaluate your “wants”, be thankful for your “haves”, and refocus your prayers on your “needs”. Life is so much more enjoyable when you stop trying to brush your bald head.